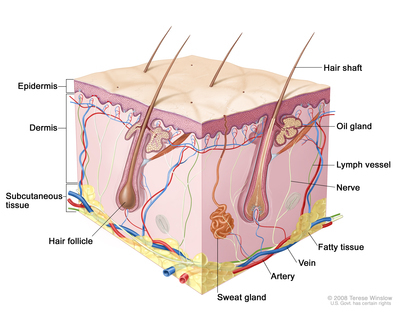 Skin cancer is a disease in which malignant (cancer) cells form in the tissues of the skin. Squamous cells: Thin, flat cells that form the top layer of the epidermis. Basal cells: Round cells under the squamous cells. Melanocytes: Cells that make melanin and are found in the lower part of the epidermis. Melanin is the pigment that gives skin its natural color. When skin is exposed to the sun, melanocytes make more pigment and cause the skin to darken. Skin cancer can occur anywhere on the body, but it is most common in skin that is often exposed to sunlight, such as the face, neck, and hands. Different types of cancer start in the skin. Skin cancer may form in basal cells or squamous cells. Basal cell carcinoma and squamous cell carcinoma are the most common types of skin cancer. They are also called nonmelanoma skin cancer. Actinic keratosis is a skin condition that sometimes becomes squamous cell carcinoma. Melanoma is less common than basal cell carcinoma or squamous cell carcinoma. It is more likely to invade nearby tissues and spread to other parts of the body. Skin color and being exposed to sunlight can increase the risk of basal cell carcinoma and squamous cell carcinoma of the skin. Anything that increases your chance of getting a disease is called a risk factor. Having a risk factor does not mean that you will get cancer; not having risk factors doesn’t mean that you will not get cancer. Talk with your doctor if you think you may be at risk. Being exposed to natural sunlight or artificial sunlight (such as from tanning beds) over long periods of time. Fair skin that freckles and burns easily, does not tan, or tans poorly. Blue, green, or other light-colored eyes. Although having a fair complexion is a risk factor for skin cancer, people of all skin colors can get skin cancer. Having a history of sunburns. Having a personal or family history of basal cell carcinoma, squamous cell carcinoma of the skin, actinic keratosis, familial dysplastic nevus syndrome, or unusual moles. Having certain changes in the genes or hereditary syndromes, such as basal cell nevus syndrome, that are linked to skin cancer. Having skin inflammation that has lasted for long periods of time. Older age is the main risk factor for most cancers. The chance of getting cancer increases as you get older. Basal cell carcinoma, squamous cell carcinoma of the skin, and actinic keratosis often appear as a change in the skin. Not all changes in the skin are a sign of basal cell carcinoma, squamous cell carcinoma of the skin, or actinic keratosis. Check with your doctor if you notice any changes in your skin. Raised, smooth, shiny, and look pearly. Firm and look like a scar, and may be white, yellow, or waxy. Raised and red or reddish-brown. Basal cell carcinoma and squamous cell carcinoma of the skin occur most often in areas of the skin exposed to the sun, such as the nose, ears, lower lip, or top of the hands. A rough, red, pink, or brown, scaly patch on the skin that may be flat or raised. Cracking or peeling of the lower lip that is not helped by lip balm or petroleum jelly. Actinic keratosis occurs most commonly on the face or the top of the hands. Tests or procedures that examine the skin are used to detect (find) and diagnose basal cell carcinoma and squamous cell carcinoma of the skin. Skin exam: An exam of the skin for bumps or spots that look abnormal in color, size, shape, or texture. Shave biopsy: A sterile razor blade is used to “shave-off” the abnormal-looking growth. Punch biopsy: A special instrument called a punch or a trephine is used to remove a circle of tissue from the abnormal-looking growth. Incisional biopsy: A scalpel is used to remove part of a growth. 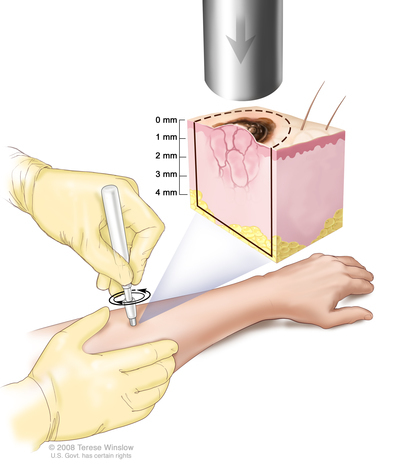 Excisional biopsy: A scalpel is used to remove the entire growth. Whether the patient is immunosuppressed. Whether the patient uses tobacco. The stage of the cancer, for squamous cell carcinoma. The size of the tumor and what part of the body it affects. Navigating Care is a full community of cancer survivors, caregivers, professionals and friends & family who support one another, share their experiences, discuss relevant topics and contribute helpful resources.